Aberdeen manager Mark McGhee was full of praise for 16-year-old debutant Fraser Fyvie following the Dons' 3-0 win over Hamilton Accies. 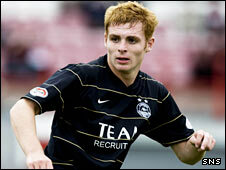 Fyvie played the whole game at New Douglas Park and fellow midfield teenager Jonathan Crawford also played. "I thought they both did terrific," McGhee told BBC Scotland. "Young Fivey kept going and was terrific, even at the end, mopping things up and playing simple passes. He will get great confidence from that." Crawford did not complete the game, with the 19-year-old suffering from cramp. "Jonathan eventually succumbed to a bit of cramp and we thought, rather than keeping him going till he makes a mistake and cost us something and embarrasses him, we took him off," said McGhee. "He did a good, good shift and we weren't disappointed in him." The victory was the Dons' first of the season after back-to-back defeats to Sigma Olomouc in the Europa League and an opening-day league loss to Celtic. "My first observation would be that we worked harder from the start of the game," McGhee said. "We established ourselves well in the game in terms of our shape and our work ethic was good - it was better. "The three goals were good. Scoring goals and keeping clean sheets and getting three points is great for us at this stage."